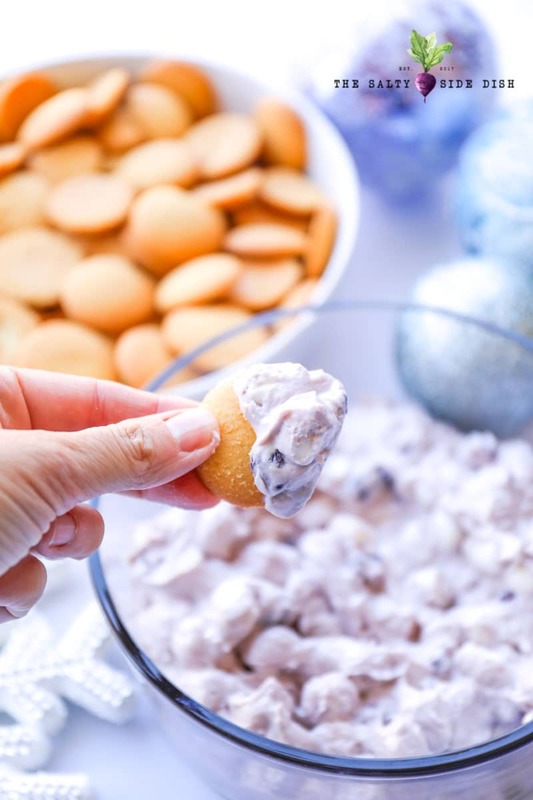 Blueberry Lemon Fluff Salad, a creamy dessert “dump” salad that takes the traditional fun of cool whip and fluffy marshmallows and combines fun fruit flavors for a side salad that everyone loves! 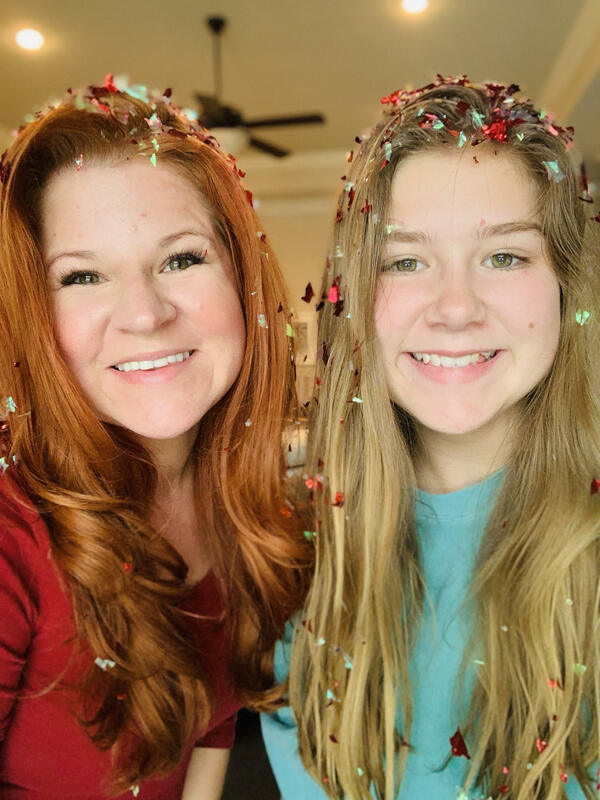 Ready to splurge on some calories and need more fluff salads to serve with your Apple Pie Fluff Salad, Watergate, Ambrosia and this fruit salad fluff with cool whip? Totally not traditional flavors, I made a blueberry and lemon fluff salad. The delicious blueberry filling combined with just a tad of the lemon tart, makes this fluff salad a not-to-sweet not-to-savory dessert salad option. The other day I set out to prepared some brand new fluff salad recipes that shied away from the traditional pistachio flavors of Watergate before us. I still love the whole concept, I mean is there ever a time that cool whip isn’t a YES? But they can get mundane and predictable and this was one of the new recipes that worked out. Now out of all my fluff salad ideas, this is the one that still needs a bit perfected. 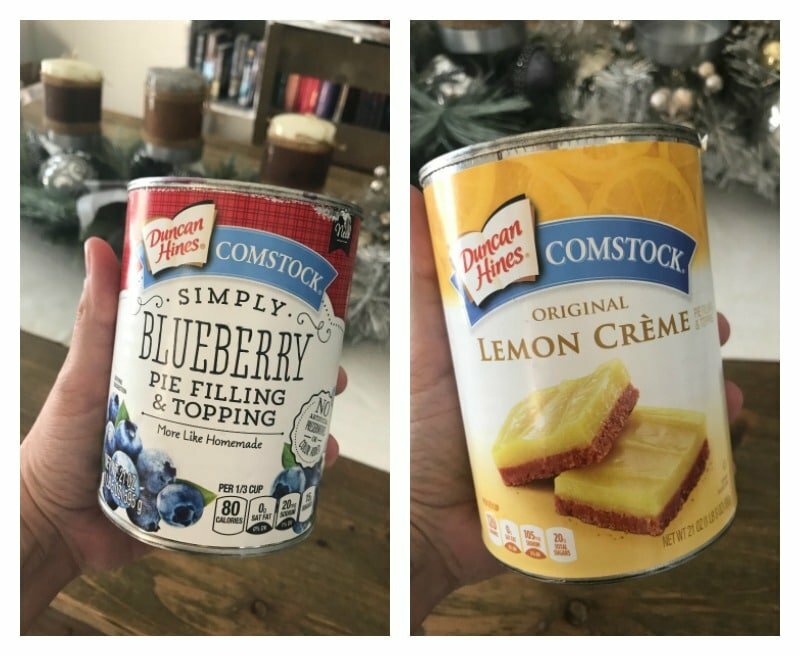 The lemon curd overpowers the blueberry and turns it more into a Lemon-Blueberry Fluff instead of a Blueberry-Lemon fluff and I am not going to give up till its perfect. In the mean time, however, it makes a fun fluff dessert that we all did enjoy so Id love your feed back. Premake your vanilla pudding – If you use “heat and serve” its very quick and can be used in under 20 minutes. The longer it sits, the more it thickens, so give it at-least 15-20 minutes prior to mixing in. The longer, the better. Combine 1 cup of Vanilla pudding, 1 cup of blueberry filling, 1/4 cup of lemon curd, and 8 oz of cool whip. Fold until combined. Now add white mini marshmallows. Feel free to crunch up vanilla wafers for a “crumb” topping or dip your cookies right in! Can be served immediately or if you want the marshmallows to REALLY fluff up, put in the fridge overnight! 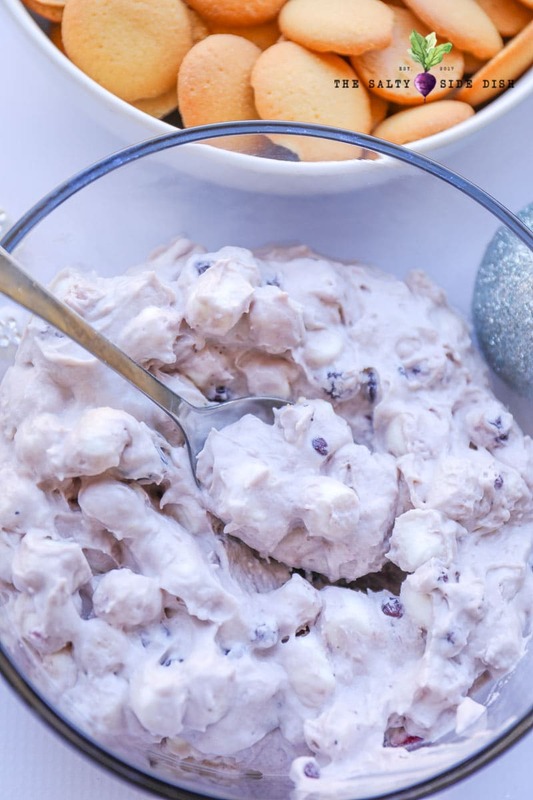 Blueberry Lemon Fluff Salad, a creamy dessert "dump" salad that takes the traditional fun of cool whip and fluffy marshmallows and combines fun fruit flavors for a side salad that everyone loves! Premake your vanilla pudding - If you use "heat and serve" its very quick and can be used in under 20 minutes. The longer it sits, the more it thickens, so give it atleast 15-20 minutes prior to mixing in. The longer, the better. 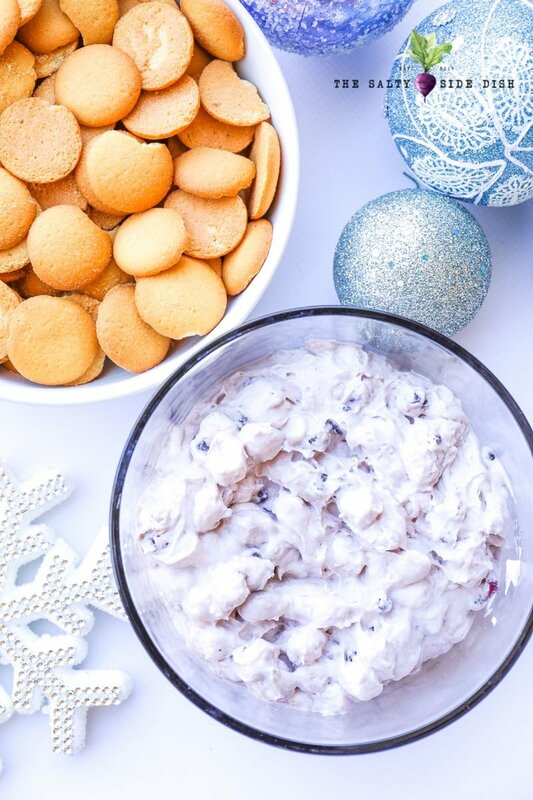 Feel free to crunch up vanilla wafers for a "crumb" topping or dip your cookies right in!